Hot location especially for Vancouverites who remember celebrating at Richards on Richards, a new Vancouver condo real estate development wil soon begin on the site of the famous downtown nightclub. Not much info yet on Richards on Richards condos in downtown Vancouver but you can keep your eye on www.richardsliving.com or call 604.688.2875 for more information as it becomes available. Sales for this Richards residences in Vancouver real estate are expected to commence this fall with prices starting from $399,900. Landmark Living advertisement explains: Location – Downtown, Yaletown, Irreplaceable. Now previewing with most pre-construction Richards Condos one bedroom suites from $419,000 to $479,000 and most two bedroom presale Richards condominium suites from $599,000 to $759,000. Brought to you by the Aquilini Investment Group, the Richards Living condominium residences is marketed by Rennie. Home ownership in downtown Vancouver at Yaletown Richards real estate development never looked better in the city core and the presale suites range from 539 to 890 square feet. 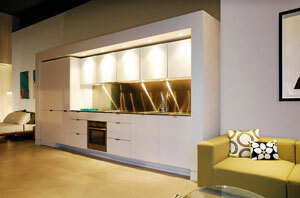 The Richards Living Penthouse and sub penthouses in Yaletown real estate community are from 1018 square feet. The Downtown Richards Condos Presentation Centre is located at 1066 Richards Street and is open daily from 12 to 5pm and closed Fridays. For more information, please visit www.richardsliving.com or call 604.688.2875. Your view of Vancouver is unparalleled here at the new Yaletown Richards condos for sale. Richards Condominiums – a rare defining modern centerpiece in the heart of Vancouver real estate’s coveted Yaletown district. Featuring an eighteen story glass condo tower and breathtaking views of False Creek, the North Shore mountains and beyond, the final release of presale Yaletown Vancouver Richards condos is now underway. Offering deluxe interiors, fabulous private rooftop urban orchard park, professional landscaping and elements of a heritage restoration, Richards Yaletown Vancouver condos for sale is the ultimate downtown home and address. Only 22 homes remain at pre-construction pricing! The one bedroom floorplans at Richards Yaletown condos (some with dens) start from just $418,900. Plus, there are a select few two bedroom Yaletown condos at Richards Vancouver living starting from $494,900. Visit the Aquilini Presentation Centre at 415 West 2nd Avenue which is open from twelve to five every day except for Fridays. The extended 2010 Olympic hours are ten to six until February 28th. Sales Begin Tomorrow at Downtown Vancouver Richards Yaletown Living! Vancouver - Downtown - Yaletown. Priced for today. Vancouver Richards condos are offering 105 one bedroom presale homes under $350,000 and 31 two bedroom condominium suites from under $550,000. Presales Downtown Vancouver Richard condos begin tomorrow! A big Thank You to everyone for visiting us at our Yaletown Richards Living Presentation Centre over the last two weeks. So many of you have expressed interest in this amazing Yaletown real estate development so we have decided to starts sales EARLY! WITH ONLY 220 HOMES AVAILABLE WE CAN NOT WAIT ANY LONGER! SALES BEGIN TOMORROW, WEDNESDAY, JUNE 3, 2009 - DOORS OPEN AT NOON. Our downtown Vancouver Richards Condo Yaletown Presentation Centre is located at 1066 Richards Street. 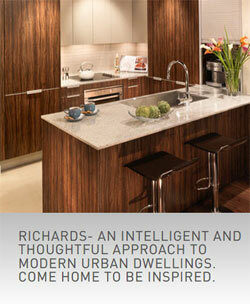 For more information contact us at 604.688.2875 or visit us online at richardsliving.com. See you soon! The neighbourhood around the presale Richards condominium suites is absolutely outstanding. As for as nightlife is concerned, anytime during the day or night , you can enjoy the wealth of wining, dining, dancing and many other outdoor activities along Richards Street and all that downtown Vancouver entertainment has to offer. As far as convenience is concerned, residents at the pre-construction Vancouver Richards residences will enjoy banks, Chapters, Staples, Future Shop, Scotiabank Theatre, post office, 7/11, mini storage, Shoppers and Winners just steps away from your private presale condo residence at Richards Vancouver. When lounging is concerned, well the Yaletown Richards condos will have perfect night and day spots for you and your friends. There are a tonne of choices when it comes to boutique shopping in Yaletown real estate distrct as you know, and also plenty of grocery stores and organic grocers for you to choose from. Hotels are also nearby. Lcoated just a short walking distance from Vancouver’s world class urban neighbourhoods and everything they have to offer from shopping, entertainment, dining, theatre, gourmet grocery stores and cafes, the Richards Living Yaletown condos are impeccably located. For you to get to and from your favourite places, the Yaletown Richards condominiums are steps from the Granville SkyTrain station, future Canada Line Vancouver City Centre and Yaletown Roundhouse Stations as well as Stadium SkyTrain station. “At the heart of every Richards home, contemporary and streamlined design reflects the quality and style of urban living. Stylish, sleek lines and pleasing proportions enance your own personal style, complemented by world brnads such as Eggersmann for cabinetry and AEG and Blomberg for appliances. Clean and simply yet sophisticated the living reas feature engineered hardwood floors while the bathrooms boast oversized porcelain tiles.” Some of the incredible presale Yaletown Richards condo features include two colour schemes, designer carpeting in bedrooms, front loading washer and dryer in addition to imported tiling, wide plank hardwood flooring and custom cabinetry. In addition, the streamlined bathrooms at the Richards Yaletown condominium pre-construction Vancouver properties includes Eggersmann cabinetry, 3/4 “ granite counters, glass mosaic tiling, recessed pot lighting and large format tile on floor and shower surround. The masterful kitchens at the presale Richards Living condo homes presents the Blomberg bottom mounted fridge, matching Eggersmann integrated paneling, AEG appliances, under mount puck lighting, mosaic tile backsplash, Cashmere White or Silver Pearl 3/4 “ solid granite counters, stainless steel sink, large floor tiling and recessed pot lighting. As far as amenities go for this pre-construction Yaletown real estate development in Vancouver downtown, you can expect podium level garden, double height lobby entrance and extra security with enterphone, camera, and double gated garage entry. You can see the views online. Suite 1902 is an impressive Richards penthouse Yaletown condominium suite that features three bedrooms plus a den and is 1314 sq ft in size. Plan M or Suite 1901 at the penthouse level of the downtown Vancouver Richards Yaletown condo tower is a three bedroom home with 1170 sqft with SW views. Suite 1904 is Plan L which is a two bed and den penthouse Richards condo with 1018 sf and views to the NE. Lastly, the pre-construction Yaletown penthouse at Richards Living presents Suite 1903 or Plan 01 which is a 2 bed plus family plus den home with 1213 sft and views to the NW. The impressive Yaletown townhomes and townhouses in downtown Vancouver real estate market are here at Richards Living. Here you will find a great number of one bedroom to two bedroom townhomes. Suite 103 or Plan Y on the ground floor is a 2 bed unit with 890 sq ft and views to the sW with a large open patio. On the SW corner is Suite 101 which is Plan G1 at Yaletown Richards townhomes and is 2 bed plus den and 911 sf. Suite TH1 which is a pre-construction Yaletown townhouse at Richards Vancouver is Plan THC and is 1 bedroom with 1055 square feet of living space. The THA floorplan at the Richards townhomes is 1180 sq ft and two bedrooms while THE plan is 1186 square feet. Whatever you are looking for, the pre-construction Yaletown Richards townhomes will deliver the floorplan that you desire. Richards Is Not Just Where You Live, But How You Live. According to the Richards Living Condo website, the design of the downtown Vancouver residential tower is impressive. “Architecture engages the eye and sets the tone of a community, and at Richards, it plays an especially significant role, reflecting the unique history, culture, local flavours and natural attributes of downtown Vancouver. Chic landmark residences with exceptional concrete, glass and metal construction offer clean lines and calm attitudes, and a serene urban aesthetic that embraces a sleek west coast style. The architect’s richest gesture includes the lush, green rooftops on the townhomes, a visual feast of sustainability.” As you can picture, the downtown Vancouver Richards Yaletown condo presales are all about sustainable living in the city centre where striking modern architecture meets livable spaces that calm and relax you at every moment. The Yaletown real estate developer for the pre-construction Richards condominiums in downtown Vancouver property market is Aquilini Investment Group, owners of the Vancouver Canucks and an Official Supplier for the 2010 Olympics and Paralympic Winter Games. Before we get to the Paris Annex Gastown Development, here is a quick update on the pre-construction Scene East Vancouver Condominiums launching this fall. 16 all new concrete homes linked to the historic Paris Block in the heart of Vancouver’s historic commercial district in downtown Vancouver Crosstown/Gastown real estate. The Paris Annex condo homes and residences are now accepting priority registrations online at their marketing web site at www.parisannex.com or you can call 604.689.LOFT to contact a sales rep at the Salient Group real estate developers. Located right next to the historic Paris Block Gastown Vancouver residences, a younger and new sibling will arise at the pre-construction Paris Annex by the Salient Group which will mark 100 years since the Paris Block was built. The Paris annex presale condominium residences will be built with concrete construction and will have shared corridors, stairs and elevators with the already completed Paris Block residences in Gastown real estate downtown Vancouver. Some of the simple facts of the Paris Annex residences in downtown Vancouver Gastown include a great extension project from the presale Paris Block historic loft style homes built in 1907 and recently renovated to its former glory. The pre-construction Paris Annex condo homes will be built with concrete and style with double sliding patio glass doors, impressive floor to ceiling windows that allow for incredible views of Gastown, downtown Vancouver Harbour and the North Shore mountains in addition to being located in a thriving and vibrant neighbourhood in Gastown real estate. The Woodwards Development with SFU and two condo high-rise buildings is just next door to the Paris Annex and Paris Block real estate developments by the Salient Group Gastown and so is Wild Rice, Victory Square, Boneta, Chambar and all the revitalized districts of Gastown, Crosstown and Chinatown are at your step. The outdoor living spaces at the presale condos at Paris Annex Gastown residences include a huge common roof top deck for residents and homebuyers in addition to a fully furnished built in gas BBQ, outdoor gas fireplace, private balconies with views, large decks in most Paris Annex floorplans and penthouse suites with a private rooftop deck with outdoor kitchens and gas fireplaces all included with the sales price of your presale Paris Annex unit. In addition, the efficiency of both the Salient Group Paris Block and Paris Annex condo residences include two in building co-op cars for all to share and a high speed elevator, keyless entry with fobs, security, high security in common areas, high speed internet and cabling and in suites alarm pre-wiring for your safety. In addition, the interiors of your pre-construction Gastown Paris Annex condominium suites will include such finishes as frlong laoding washer and dryer in suite, designer roller shades, custom millwork closets, glass bathroom light wall, glass and slate bathroom tiling, polished concrete flooring and integrated designer kitchens. In addition, the features included with your pre-sale Paris Annex Gastown condo homes includes an open plan with modern spaces for relaxing and entertaining in addition to nine to thirteen foot ceilings. Model suite pictures of the Paris Annex residences is located online at http://www.parisannex.com/model-suite.html. A photo gallery of the Gastown real estate district where the Paris Annex and Paris Block Salient Group real estate developments are located is online at. http://www.parisannex.com/gallery.html. The project team for the pre-construction Paris Annex residences include the Salient Group, Hearthebrae Builders Co. Ltd., SML Consultants Group Ltd., Jade West Mechanical Engineers, Glotman Simpson Structural Engineers, Evoke International Design and Glair Williamson Architects. A neighbourhood map is also located on their website at http://www.parisannex.com/neighbourhood-map.html. As you can see, it is just east of Woodwards development and north of International Village in Crosstown real estate in downtown Vancouver. The presale Vancouver Paris Annex Crosstown condos is located in a transitional area that is currently undergoing massive renovations and revitalizations and includes great boutique stores, great restaurants and close proximity to transportation routes. Unit 206 is a one bed and one bath unit of 762 square feet with a 84 sq ft patio and you can see a juxtaposition of modern design beside a restored historic shell at the Paris Annex downtown Vancouver Salient Group real estate development beside the Paris Block. This creates a visual commentary that is unlike most other residences. All new concrete construction nestled in Vancouver’s original neighbourhood of Gastown real estate. Respectful of our past and hopeful for the future. And your furniture will work and look great here too at the pre-construction Paris Annex and Paris Block condominium residences. Unit 207 is a one and one as well with 780 square feeet, while the Paris Annex penthouse suite is a two bedroom and two bath unit of 1362 square feet in interior living space and a 115 square foot balcony plus a 866 private roof top deck for private enjoyment. The Paris Annex penthouse Unit 607 is a two and two with 1438 sq ft. If you are looking for more detailed and downloadable Paris Block and Paris Annex condo floor plans please visit their web site at http://www.parisannex.com/floorplans.html. Just released are 16 spectacular, modern presale Gastown loft residences in the Paris Annex. This glass and concrete structure adjoins the Paris Block Gastown residences, a revied heritage building that was once home to Pierre Paris & Sons – a logging boot manufacturer and shoe retailer – and will share a grand entry, interior stairs, and spacious rooftop deck with its historic sister. Ideally locate din the heart of the up and coming Woodwards District in Vancouver Gastown real estate market, the Paris Annex Gastown loft conodminiums starts private showings soon. A full Paris Annex display suite opens in the Paris Block at the end of September. For more information about the presale Vancouver Gastown Paris Annex condo homes, please visit www.parisannex.com or call 604.689.5638. Gastown has a vibe, a unique sense of presence. Here cutting edge urbanity melds seamlessly with historical character and a trendsetting artistic outlook on life. And right on the edge of the Gastown real estate district of downtown Vancouver is the Paris Annex condominium apartments, the sizzling sister residence to Salient Group’s successful heritage conversion, the Paris Block. A great article by Susan B explains the uniqueness and luxurious nature of these Gastown Paris Block residences now previewing and selling to a few lucky home buyers. Ever evolving, Gastown real estate continues to attract a vibrant, ecletic mix of people. But all share a passion for urban living. And Parris Annex condominium residences in Gastown real estate means you’re just steps away from the host of amenities that downtown Vancouver has to offer in this truly amazing community. Here you’ll find the best restaurants to satisfy all your cravings in addition to find dining and fast foods, in addition to boutique shopping and malls too. The presale Paris Annex Gastown condos are part of the revitalization of this cultural district and are close to Chinatown, the seawall where you can bike, walk or rollerblade as well as many other great spots that remain untouched. The pre-construction Paris Annex Gastown condos offers a total of only 16 one and two bedroom new Vancouver condos and also two spectacular penthouse suites and are located at 53 West Hastings Street in downtown. The prices of these experiential Paris Annex condo homes in Gastown real estate market start from the high $300,000s with most suites priced in and around the mid $400,000s mark. The Paris Annex presentation centre and display suite is opening in October and to receive more information about these exceptional pre-construction Gastown Paris Annex condo residences please register online at www.parisannex.com for all the details. Poised to bring a distinctive sophistication to downtown Gastown living, the pre-construction Paris Annex is a study in modernism. All 16 pre-sale Gastown homes have an edgy, linear styling and true open concept design for their floor plans – think Soho flair meets Richard Neutra. With total flexibility in space, open kitchens, large living rooms, huge windows which allow natural light into the residences, you can individually customize your presale Paris Annex homes according to your lifestyle. The colour palette is pure 21st century – a dramatic, angular union of white and metal with black accents. Floors are polished concrete in natural grey – kitchen counters and backsplash are stainless steel; dishwasher and fridge are fully integrated within te high gloss white cabinetry. The Gastown pre-construction Paris Annex real estate development is clean, uncluttered and truly sensible. Even the bathroom door shows a metirculou attention to detail at the new Gastown condo homes at the Paris Annex building with full height and no hardware visible thanks to hidden hinge construction. Inside, black slate forms the surround for a tub that is decadently deep and inviting. A frameless glass door appears to float along two thirds of its length for privacy when showering. Most Paris Annex Gastown real estate condos for sale also boast private balconies or decks. Plus, there’s a huge common rooftop deck where owners can relax beside the outdoor fireplace and watch the sunset, whip up dinner on the built in barbeque or simply admire the downtown cityscape. The Paris Annex is ultimately linked physically to the Paris Block Gastown condo building with common elevators and stairwells. The Paris Annex signifies the new modern age of Gastown real estate for sale. Introducing the email marketing for the new downtown Vancouver condominium apartment development at the Paris Annex in the Gastown neighbourhood. Paris Annex is an extremely limited opportunity to own one of only 14 modern flats and 2 penthouses located in the Woodwards District of Gastown. These pre-sale Paris Annex homes are truly one-of-a-kind – no two are the same. All new concrete construction with sleek finishes throughout: integrated kitchens, dramatic overheight ceilings and floor to ceiling windows that will open onto private decks or balconies. And, there will be a fully landscaped shared rooftop deck at the Gastown Paris Annex condominium building for even more outdoor enjoyment. Pre-construction Gastown homes at Paris Annex in Downtown Vancouver real estate market will be ready for occupancy at the same time as the Woodward’s development will be finished… which means you will have a drug store, grocery store, the new SFU campus, and a host of other services all within a few feet of your new home. The new Gastown homes are priced from just $399,000, with all homes under $500,000 (including the Paris Annex penthouses). First of its kind exclusive Co-Op Car Program – there will be two co-op cars located in the building for the exclusive use of the owners at Paris Annex condominium apartments. And, you will have access to all vehicles in the Cooperative Auto Network in downtown Vancouver as well. The early purchase program for the first eight home buyesr at the Paris Annex Gastown condo homes – with a variety of options to choose from, which could mean your mortgage payments from less than $1000 per month. 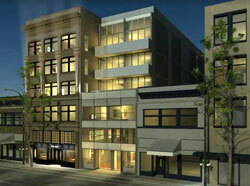 This is a solid Gastown real estate investment in downtown Vancouver – ask about their Guranteed Rental Program. Sales start October 14th so please call or email the Salient Group about scheduling a private viewing of the finished display suite in the Paris Block, connected to the new Gastown Paris Annex apartment condominiums. Call 604.689.LOFT for more information about the Salient Group’s Paris Annex apartment homes or just visit parisannex.com. An unbeatable Yaletown lifestyle is upon us at the newest Yaletown real estate development property at Richards Living in Downtown Vancouver property market. Richards Living features a total of only 226 presale downtown Vancouver condominium residences in a variety of one bedroom and two bedroom floor plans – some with den, solariums or family rooms – and the Yaletown Richards condos are priced from $419,000 with over half priced below $500,000 plus GST as it is a pre-construction Vancouver condo property. The Richards Yaletown condos presentation centre is locate at 1066 Richards Street in downtown Vancouver real estate market and is open noon to 5pm daily except Fridays. For more information please call 604.688.2875 or you can visit their website at www.richardsliving.com. According to Susan B. for the New Homebuyer Guide of Greater Vancouver: On our way outside into the afternoon sunshine, Greg and I compare notes on what makes downtown Vancouver real estate such a great place to live, the Vancouver Art Gallery, Orpheum Theatre, Gastown boutiques, cycling the seawall, shopping on Robson Street, the choices seem endless. One thing for sure though, I won’t be needing that expensive gym membership any more, there’s a fully equipped fitness centre right on site at the Yaletown Richards Living condo development. Plus, there’s a podium level urban orchard for when I’m in the mood for a gentler workout simply strolling along, the outdoor pathway at the presales Richards Living Yaletown condominium residences. But for now, I think I’m off to check out one of those 40 Yaletown restaurants. It was one of Vancouver’s favourite landmarks – Richards on Richards. Like virtually everyone who’s lived in Vancouver during the ‘70s, ‘80s or ‘90s, I have many fond memories of the trensetting, avnate guard nightclub located on the edge of downtown and Yaletown Vancouver real estate. So it seems fitting that heritage and history will live on in a new residential condo presale building sporting the same address at the Yaletown Richards Living condos. Now to be known simply as Richards, this new icon will feature a sleek 18 storey condo tower with walk up brick townhomes, two 1907 Edwardian inspired heritage homes, and amenities to satisfy your every urban craving. “People love this part of downtown, and they’re so excited about an opportunity to get more from it because Richards really is one of the last developable properties here,” says project manager Greg. “In fact, most of the people who stop in to look at the Richards Living Yaletown condo presentation centre either live nearby or already frequent the neighbourhood – did you know Yaletown alone has over 40 restaurants?” I do know. The Richards Yaletown condo display suite is an urban-chic, distinctly clasy one bedroom with flex space. As usually happens in real life, Greg and I are soon ensconced in the kitchen – a dramatic combination of dark wood tones and high-gloss white textures. First, I chec out the Eggermann Cabinetry and concealed Bloomberg fridge and dishwasher – modern European style beauties all of them. “This is open of my favourite features,” Greg says pointing out the appliances parkade that allows you to keep items like toasters and coffee makers tucked out of sight but plugged in and instantly accessible for home owners at the Yaletown real estate development at Richards Living Vancouver. A brushed aluminum roll down door looks downright funky, somehow harkening back to this area’s industrial heritage but with a totally 21st century edge “Here’s a neat number for you,” Greg says remembering my fascination with unusual information. “Including the floor to ceiling pantry wall, this Richards Living Yaletown condo kitchen’s cabinets can hold 2,268 cans of Campbell soup.” I can’t help smiling to myself as I visualize him loading that many tins onto the shelves – what dedication. As I glance across the Yaletown Richards Living condominium dining talbe to the living room, I realize I must be doing something wrong with my mental math. The downtown Vancouver Richards Living floorplans said this is a 540 square foot home, but it feels much larger. “These presale Yaletown homes make such efficient use of space,” Greg says as if he is reading my mind. “So you really can have a full sized sofa and dining room suite in here and stil have an open feeling. And because the square footage is less, the price point is very attractive.” Now selling the downtown Vancouver Richards Living condos in the Yaletown real estate market are going to sell out quickly. 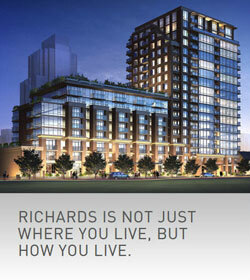 Visit the Richards Yaletown presale condo web site at www.richardsliving.com for more details. Buy it on October 4th! Richards Condo Living – “Set on the historic site of one of the city’s most famous cabarets, the new ‘Richards’ development promises high end luxury with an affordable price tag” according to the West Coast Homes and Design Magazine. Revisiting Richards. Set within the downtown Vancouver real estate district, the presale Vancouver Richards condos are just steps away from the trendy Yaletown district where you can find a multitude of dining, lounging and shopping options. In addition, with an eclectic resident base, the Yaletown Richards condominium community will be vibrant and ever changing. With truly usable and functional floor plans, the pre-construction Richards Yaletown condos offer spacious layouts where no room is wasted. In addition, these affordable downtown Vancouver condominium residences at the Richards Condos will be an important factor in the presale launch events. It is said that about sixty per cent of all the pre-construction Richards Yaletown condos in downtown Vancouver real estate will be priced for less than $500,000. This is great value for the Yaletown real estate district as you know. With a chic landmark address, the historic downtown Vancouver Richards address will be transformed into a residential building with a heritage brick façade complete with expansive windows, large balconies and a lush green podium rooftop where you can find professionally landscaped grounds for residents to enjoy. Also close by are all the grocery stores, restaurants and entertainment options that you look for in a downtown Vancouver address. Some of the luxury features of the pre-sale Richards Condos in Yaletown district include the appliances that include AEG and Blomberg in addition to custom designed European Eggersmann cabinetry. Some of the community amenities at the pre-construction Vancouver Richards Living condo tower include a podium level green space and a full fitness gym. Located in an up and coming neighbourhood that has mostly been revitalized with residential condominium towers, the Richards Living condos in downtown Vancovuer real estate features a coveted address in the form of a luxurious eighteen storey condo tower. With an eight storey podium at the old Richards on Richards cabaret site, the new Yaletown condos are both affordable and conveniently located. However, now previewing, the presale Richards Yaletown condominium suites only number 228 total homes. Also part of this downtown Vancouver real estate development is the restoration of two beautiful 1907 heritage homes. All of the construction is slated for an eventual completion by 2011 after the Winter Olympics. The luxury pre-construction Yaletown condos at Richards Living in Vancouver start at $419,900 for one bedroom suites and range up to two bedroom homes and even spacious Richards Townhomes for sale. The other more luxurious suites at the downtown Vancouver real estate address includes the Richards sub-penthouse and penthouse residences which are very large (up to 1319 square feet interior space). Located at the corner of Helmcken and Richards, the two Edwardian style heritage homes will feature impressively large single family Yaletown homes that will be up to 1500 square feet. These pre-construction Richards heritage homes for sale will be three storeys high and will be two and three bedroom houses. With the heritage façade on the outside and contemporary revitalized interiors, these Yaletown Richards homes will be a hot commodity when they come onto the downtown Vancouver real estate market. The entire Yaletown property is being constructed and built by the Aquilini Developents, one of the most responsible and trusted Lower Mainland builders. For more information, you can now visit the fully furnished Richards condo display home that is located at 1066 Richards Street in downtown Vancouver. They are open noon to five and closed Fridays. You can also register via telephone by calling 604.688.2875 or by visiting richardsliving.com for additional details about this presales Yaletown condo opportunity. 111 Suites under $499,000 at Richards Living Presales! HOMEOWNERSHIP NEVER LOOKED BETTER IN DOWNTOWN VANCOUVER REAL ESTATE. We wanted to send you a friendly reminder to let you know that sales at the pre-construction Richards Condos in Yaletown Vancouver district begin this Saturday! WHEN: OCTOBER 4, 2008 DOORS OPEN AT NOON - WHERE: RICHARDS PRESENTATION CENTRE at 1066 RICHARDS STREET. With most one bedroom presale Richards Living condominium priced between $419,000 - $479,000 and pre-sales two bedroom suites between $599,000 - $759,000, own an affordable downtown Vancouver condominium in a great location. The Richards Condo SUITES RANGE FROM 539 - 890SF with pre-sales Yaletown Richards PENTHOUSE & SUB-PENTHOUSES FROM 1,018SF. *Prices and availability are subject to change. Please note that a deposit cheque and photo identification are required for purchase. Please speak to a sales representative for more details. E.&.O.E. According to Dharm of 24 Hours Vancouver, the Salient Group is lobbying the city to restore the streetscape and historic building in order to keep some character and the history of the city of Vancouver alive. Should Vancouver lose its architectural past, its cultural identity may fall soon after, according to a real estate developer, the Salient Group, keen on restoring the city’s historical streetscape. Robert Fung, president of The Salient Group, noted that, without federal and municipal funding for heritage Vancouver building restoration, projects such as the downtown Vancouver Flack Block, which re-opened yesterday at 163 West Hastings Street, could never have been realized. The City of Vancouver is reviewing its heritage revitalization incentive program. Its federal counterpart has been cancelled. The Flack Block is being celebrated as one of the first heritage buildings in North America set to achieve LEED Gold certification from the Canada Green Building Council. You can go check out the Flack Block at 163 W Hastings Street in Downtown Vancouver. Coming this summer is the final masterpiece at Brentwood Gate master planned presale Burnaby real estate community. The Varley condo residences will be released later this year at pre-construction pricing. Craftsman inspired residences nestled amidst a long established Brentwood Gate Burnaby neighbourhood by Ledingham McAllister. The Varley condo homes at Brentwood Gate will be releasing floor plans at one bedroom, one bed and den and two bed homes to choose from for home buyers. Energy efficient appliances by Whirlpool and steps to shopping, transite and amenities right on Lougheed Highway and between Beta and Delta Avenues. Pre-resgister today for the Ledmac presales Varley at Brentwood Gate final release of pre-construction condo homes in Burnaby property market today by calling 604.205.7225 or via email at info@brentwoodgate.com. The Varley condo residences are the final master planned community release of pre-sales homes by Ledmac property builders for this Brentwod neighbourhood. Introducing The Varley at Brentwood Gate! 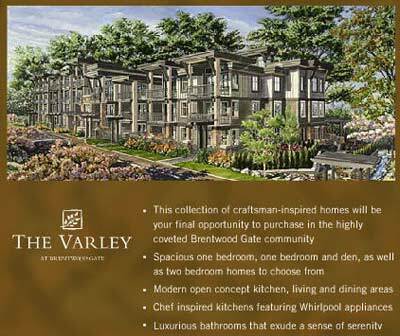 As a past visitor to the Varley Condos web site, the newest Brentwood Gate Burnaby real estate neighbourhood, we want to ensure that you are informed of the upcoming launch of the final masterpiece in our Brentwood Gate condo apartment pre-sales collection, The Varley. Each building in the Brentwood Gate real estate Burnaby community sold out in record time putting us years ahead of our sales schedule. You can be the sure the response to the pre-construction Varley at Brentwood Gate condominium residences will be much the same. Our Burnaby pre-construction team is hard at work putting the final touches on the brand new sales office and two fully furnished display suites set to open this Fall. Showcasing the fine finishings and features of the Varley Brentwood Gate pre-sales homes as well as inspiration for your own new Burnaby home, these suites are sure to impress even the most discerning purchasers. This limited collection of spacious one bedroom, one bedroom plus den and two bedroom preconstruction Burnaby residences is located in the highly coveted Brentwood Gate neighbourhood of Burnaby real estate market, and offers the convenience of living just steps from shopping, transit, and parks. Featuring open concept floorplans including thoughtful finishes such as energy efficient appliances, electric fireplaces and granite countertops these Brentwood Gate Varley homes provide the utmost in style and convenience. And better yet, you can move into the Varley apartment residences in this Spring! With its Burnaby Varley condo homes grand opening to be held this September, The Varley presale apartments will be your final opportunity to purchase in the Brentwood Gate real estate community. Don't miss out! For further information on any of the residences at the Varley by Ledmac, please contact the sales team at 604.205.7228 or via email at info@brentwoodgate.com. Sincerely, Brentwood Gates Homes West LP, Louise Barbour, Sales Manager. Another new Burnaby presales development is at the Metrotown Luna Condos. Introducing the Varley Condominius, Ledingham McAllister’s final master piece in the Brentwood Gate real estate community. This collection of craftsman inpired presale Varley homes will be your final purchase opportunity to purchase in this highly coveted Brentwood Gate Burnaby real estate neighbourhood adjacent to a long standing residential community. Priority register today to be amongst the first to receive more information on The Varley at Brentwood Gate by Ledmac Developers. Priority register today at 604.205.7228 or via email at info@brentwoodgate.com. This charming boutique complex of 19 garden flats and Burnaby High Gate Ridge townhomes is conveniently located only blocks from the HIghGate Village Mall, the Edmonds SkyTrain Station, plus parks, schools and recreational facilities. Open, functional living spaces in a choice of one, two and three bedroom plans at the Burnaby Townhomes at High Gate Ridge are affordably priced from $259,000. Features include granite counters, premium appliances, and lavish windows throughout. The presentation centre for the new Townhomes at Burnaby’s High Gate Ridge development is open noon to 5:00 pm daily except Fridays at 6708 Arcola Street in Burnaby. For more information, please call Sean at 604.782.0821 or visit www.HighGateRidge.com. Designed for family living, High Gate Ridge garden flats and pre-construction Burnaby townhomes have pricing starting from $359,900. Designed for family living, the residences at High Gate Ridge Burnaby real estate are set close to the emerging High Gate Village neighbourhood, yet located on a quiet street. High Gate Ridge redefines urban living at a price well within reach for homebuyers. A unique collection of contemporary pre-construction Burnaby garden flats and townhomes, High Gate Ridge townhouses gives you room to grow. Be at the center of a dynamic city, packed with outstanding recreational and urban lifestyle opens. A Sigma Development and marketing by Otezs. Call 604.338.8825 or visit highgateridge.com for more information. Straight from their online marketing: Designed for family living, the pre-sales Burnaby residences at High Gate Ridge townhome development are set close to the emerging High Gate Village community, yet located on a very quiet residential street. High Gate Ridge pre-construction garden flats and townhomes redefines urban living at a price well within reach. A unique collection of contemporary High Gate Ridge pre-construction Garden Flats and Burnaby Townhomes, this real estate development gives you room to grow. Be at the center of a dynamic city, packed with outstanding recreational and urban lifestyle options. With a range of one bedroom condo apartments to three bedroom Burnaby townhomes for sale, High Gate Ridge definitely provides a wealth of opportunities to choose from. All floor plans at High Gate Ridge Burnaby condominiums provide open concept designs. The low rise Burnaby condo buildings feature two residential buildings of three floors only, with the garden flats on the ground floor and the remaining presales residences at High Gate Ridge townhomes above on the second and third floors. Burnaby is well known for its beautiful residential areas, shopping, parks, entertainment and retail centers including High Gate Village, Metrotown and Lougheed Town Centre. The pre-construction Burnaby High Gate Ridge community of garden patio homes and townhouses is located just 10 kilometres from Vancouver’s downtown core. The SkyTrain is a fast track to Metrotown, Downtown, New Westminster and Surrey as well. Not only that, but home buyers and residences at the presales High Gate Ridge Burnaby real estate development will enjoy an amazing location close to Central Park, Deer Lake Park, Burnaby Lake, Burnaby Mountain trails as well as tones of shopping and dining options. The featured real estate developer for the luxurious High Gate Ridge Townhomes and Garden Flats in Burnaby is SIGMA Developments, a quality home building company known for their commitment to excellence. If you have any questions, please feel free to email them at sales@highgateridge.com or call 604.338.8825 today. Some of the impressive finishing details and features offered here at the pre-construction Burnaby High Gate Ridge real estate development include quality exteriors by Matthew Cheng Architect Inc as well as beautiful stone face work, and professional landscaping throughout the property. In addition, the pre-sales Burnaby townhomes and garden flats at the new High Gate Ridge property will be walking distance to all urban conveniences and amenities in addition to have 5x8 inch Plywood under floors to add to the sound proofing of the building. The interiors of the presale High Gate Ridge townhomes and condos will feature two designer colour schemes called Mocha or Sierra and also nine foot ceilings on the main floor that expand your space. In addition the interiors will also have convenient TV outlets, in suite laundry with front loading washer and dryers, modern satin finished interior door hardware and large sundecks or spacious ground floor patio for expanded outdoor living and entertainment space. Large windows and sophisticated hardwood style bevel edged laminate flooring in the dining and living rooms are also standard in every High Gate Ridge new Burnaby home. The bathrooms and ensuites at High Gate Ridge townhomes and condominium apartment flats will feature granite countertops, porcelain straw tiles, boa tile flooring in the main bath and smaller tiles for the second baths with white matte tiles for the wall surrounds. The chef inspired kitchens at the pre-construction Burnaby townhome development at the High Gate Ridge garden apartment flats will feature elegant light fixtures, handset white Monderey backsplashes, garborator and a stainless steel appliance package. Also standard in the gourmet kitchens at the presale High Gate Ridge Burnaby homes will be shaker maple cabinetry, under mount double sinks and polished platinum Santa Cecilia granite counter tops. All townhomes and condo flats at the High Gate Ridge presales properties will come with pre wired security alarm system with Energy Star windows, secured underground parking for owners and visitors and rain screen technology. In addition, all pre-sales homes at the Burnaby High Gate Ridge community will come with the National Home Warranty of two, five and ten years. Ideally located on a quiet, residential street that’s only a short walk from Burnaby’s vibrant emerging High Gate neighbourhood, High Gate Ridge Burnaby townhomes and garden homes offers a broad seletion of one, two and three bedroom residences. Gourmet kitchens and granite countertops throughout are just two of the quality detailing that set these pre-sale Burnaby homes apart from its competition. A perfect location for growing families at the pre-sale Burnaby High Gate Ridge townhouses and garden flats, you will be close to schools, shpping from bix box and boutique, restaurants of all kinds, SkyTrain and Central Park Burnaby. The High Gate Ridge Burnaby townhomes presentation centre is noe open one to five daily except Fridays at 6728 Arcola Street in Burnaby real estate. For more info, please call 604.338.8825 or you can register online at www.highgateridge.com. The Radiance at Sunstone Delta real estate development has launched including details about the Terella and North Pointe Homes by Morningstar and Polygon. Homes starting from just $1,638,000 and just 35 minutes from downtown Vancouver in the beautiful community of Anmore. These luxury country traditional style detached single family homes in Anmore at the pre-sales Crystal Creek development are now available. There are only 18 exclusive luxury executive pre-construction homes at Crystal Creek Anmore available at this time and the neighbourhood is just minutes from Brantzen Lake and White Pine Beach. With exquisite custom cabinetry, finishes and detailing, these single family detached Anmore homes at Crystal Creek are located in nautral forest setting in aprivate enclave of cul-de-sacs. Open Saturday and Sunday between the hours of one and five in the afternoon, the Crystal Creek Anmore homes are now open or you can call 604.461.1308 for weekday appointments for viewing. Raising the bar in luxury living… Georgia Award finalist Marcraft Homes welcomes you to the exclusive community of Ridgewood Estates in Anmore, BC. A prestigious collection of custom designed Anmore homes. These one acre Marcraft Homes Ridgewood Estates homesites take advantage of expansive mountain views and forest views. Marcraft Homes uses natural exposed wood and stone elements to bring nature indoors. Each pre-sale Anmore Ridgewood Estates home site has every amenity a family could ask for; from movie theatres, games rooms, wine cellar, yoga and fitness studios, as well as award worthy gourmet kitchens and executive office space. The elegance of natural living with downtown Vancouver convenience and lifestyle just minutes away from these pre-construction Anmore family homes at Ridgewood Estates. Plant the seed of your dream today! Price from just $2.2 M. Please call to visit the onsite information centre for the Anmore Ridgewood Estates family homes open every Saturday and Sunday from 1:00 to 4:00m or visit www.ridgewoodestates.ca. More information about Marcraft Homes such as the Ridgewood Estates Homes in anmore and other communities can be found online at www.marcrafthomes.com. Your only neighbour is Mother Nature. The Anmore home sites in Greater Vancouver Ridgewood Estates will allow you to live the lifestyle you’ve always dreamed about living. From schools to entertainment, recreational to emergency services and from transportation to routes, the Anmore Ridgewood Estates homesites will be in close proximity to everything you want to see and do on a regular or daily basis. Your private oasis at this small gated community of Ridgewood Estates in the prized Anmore real estate community will become your dream family home for generations to come. 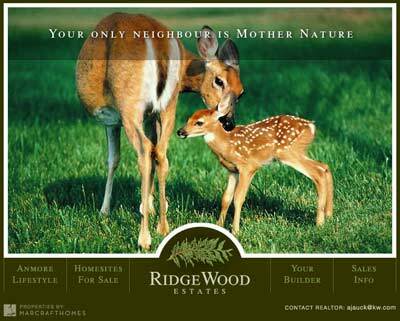 The Ridgewood Estates home sites for sale allow home purchasers in Anmore property market to custom design your own one acre home site in a private parkland setting. The 11 homesite and anmore lots available are online and you can visit this page for more details about each lot http://ridgewoodestates.ca/homesites/index.html. The unique qualities of the builder for the Ridgewood Estates in Anmore BC real estate is Marcraft Homes which is an established and highly touted family business. Sales information for these Anmore home sites can be requested from Keller Williams Results Realty and their representatives, Andrea and Nikki and updates can be seen online at their web site. Keller Williams Results Realty. Raising the bar in luxury living… Georgie Award finalist Marcraft Homes welcomes you to the exclusive community of Ridgewood Estates in Anmore, BC. A prestigious colleciton of pre-construction custom designed homes. These one acre Ridge Wood Esates home sites in Anmore real estate take advantage of expansive mountain and forest views and Marcraft Homes uses nautral elements to bring nature indoors. Each pre-sale Anmore home has very amenity a family could ask for: from the movie theatre rooms, games rooms, wine cillar, yoga and fitness studio as well as award winning gourmet kitchens and executive offices. The elegance of natural living with downtown Vancouver convenience and lifestyle just minutes away from your new Anmore home at Ridgewood estates home sites. Plant the seed of your dream home today! The prices for the home sites and new Ridgewood Estates Anmore houses are from $2.2 million. Please call to visit the onsite information centre at Ridgewood Estates in Anmore real estate property. Andrea Jauck at 604.783.3124 or Nikki Jaimes at 604.230.8811. Located in the Village of Anmore real estate just north of Port Moody BC, Chartwell Green home sites is a collection of just seven presale Anmore estate home lots for sale. Surrounded by greenery, here you can bring the builder of your choice or use one of the sellers recommended home builders for your dream house at the Anmore Chartwell Green single family zoned neighbourhood. Lot purchasers are invited to meet the challenge of making sustainable design a guiding fundamental in every pre-construction Anmore chartwell Green home. For more information about this home site and lot release in Anmore real estate at Chartwell Green, please contact 604.942.4114 or you can visit their web site at www.chartwellgreenliving.com. Own a piece of paradise at the Chartwell Green homesites where living in harmony with nature is what you can expect. Chartwell Green Anmore home sites and lots is a community of seven esttae home building lots in beautiful Anmore, British Columbia. Nestled in the Village of Anmore Chartwell Green homesites brings responsibility to the community, nature and homeowners. Bring your builder or you can choose from a preferred developer to live your dream. Residents at Chartwell Green home sites and lots for sale in Anmore BC will love the tranquility and openness of the estate size lots yet still feel their home is a private getaway surrounded by nature. Imagine the sounds of nature each morning as you grab your biking gear and head out for a quick trip up to Buntzen Lake or choose to take the pathway leading through the forest to the Mossom Creek Fish Hatchery. There is an unlimited opportunity for learning and understanding the habitat nature of the community here at the Anmore home sites and lots at Chartwell Green community. Chartwell Green draws its character from the forest, its vision from leading green technology and life from the abundance of nature. This Chartwell Green Anmore lot site demands preservation and respect for the environment. We invite home owners and builders to embrace the surrounding environment and meet the challenges of the building guidelines here at Chartwell Green lots and homesites in Anmore BC. Residents of Chartwell Green Anmore real estate will be able to connect and live within nature. Lot 1 at Chartwell Green homesites is 34,848 square feet or 0.80 acres. Lot 2 is 43,995 sq ft or 1.01 acres while Lot 3 is 43,560 square feet or 1.00 acres in size. The new Anmore Chartwell Green Lot 4 is 52,272 sq ft or 1.2 acres and Lot #5 is 59,677 sq ft or 1.37 acres. The two remaining Chartwell Green Anmore real estate homesites include Lot 6 at 62,290 sq ft or 1.37 acres and Lot #7 at 34,848 square ft or 0.80 acres. Living in harmony with nature is the essence of Chartwell Green estate home sites. We value our responsibility to the existing neighbours, the community of Anmore Chartwell Green lots and residents of Anmore and Port Moody. We strive to not only preserve the natural beauty of the environment but also challenges ourselves to ehance and invest in the Anmore community experience. We believe in great design when partnered with environmental sustainability. We invite home owners and builders at the Anmore real estate lots at Chartwell Green community to meet our challenge and make sustainable design a guiding fundamental principle. Your questions can be sent to info@chartwellgreenliving.com or you can call the Anmore Chartwell Green Living Inc. at 604.942.4114. The Chartwell Green estate lots and home sites in Anmore real estate market are now selling. Located in the quiet Village of Anmore, just north of Port Moody real estate, Chartwell Green is a collection of just seven estate home lots. Surrounded by greenery, here you can bring the builder of your choice or use one of the recommended builders to build your dream home at the Anmore Chartwell Green home sites and luxury lots for sale. Home buyers here at Chartwell Green in Anmore real estate are invited to meet the challenge of green building design and construction principles to minimize the impact of your home on the beautiful natural surroundings around the subdivision of these home sites in Anmore BC. In addition, if you would like more information about the Anmore Chartwell Green lots for sale, please visit chartwellgreenliving.com or call 604.942.4114 for all the details. If you want to live within nature and the pristine forests, then the new Anmore Chartwell Green single family homes development will be ideal for you and your family. Right now, the Chartwell Green acreage home sites are offering new low pricing and no interest financing as well! There is no better time to build your dream home in Anmore real estate market that features the new and affordable Chartwell Green on Summerwood Lane acreage home sites from $665k and finished new Anmore homes from $1.288 million. The new Anmore acreage homesites feature sunny southwest exposures and some even have inlet water views that are unobstructed. In addition, the homes at Chartwell Green homesites and acreage also feature a location backing onto greenbelts that are there to stay. These easy build sites allow home buyers to save on construction when they are ready to build their dream Anmore home. Just minutes to Newport Village, Coquitlam Town Centre and the West Coast Express train, the Summerwood Lane Chartwell Green luxury Anmore homes and acreage lots are now selling quickly. No bridges are required to get to Vancouver and there will be extensive subdivision landscaping to give your community a professional feel with great curb appeal and lasting value. Special zoingint o build big and or add a carriage home are also possible at these new Anmore home sites for sale at the Chartwell Green acreage lots. Contact 604.944.0446 or visit www.chartwellgreenliving.com for more information. Set along the shores of Indian Arm and immersed in nature, the Village of Anmore real estate now presents the new Chartwell Green subdivision that features completed Anmore homes for sale in addition to lots and acreage. A great semi-rural neighbourhood close to Sasamat Lake and the urban centres of Coquitlam and Port Moody, the pre-construction homes at Anmore’s Chartwell Green on Summerwood Lane is an exclusive neighbourhood for those who love the forests and natural beauty of the Lower Mainland forests. When a new subdivision such as this comes to the Village of Anmore, people tend to take not. With just seven building lots and home sites that are carefully planned, these real estate Anmore opportunities do not come along very often, so you will need to act quickly. The nature inspired lots for sale at the Anmore Chartwell Green subdivision ranges between 0.8 to 1.37 acres and with buildable lots along cul-de-sacs and greenbelts, there is no other development such as this in the Village of Anmore real estate market. The building lots and acreage are very level, allowing you to construct and build your dream home with less costs. In addition, the property developer has made many careful considerations for views, exposures, preservation and environmental sensitivity so that home builders and owners at the Chartwell Green Anmore building lots will enjoy generations of healthier living in this beautiful community. The new spacious lots at Chartwell Green homesites are also zoned to allow carriage homes on the property. These legal second residences make an ideal spots to house family or host guests, while increasing the property’s value. Chartwell Green Anmore home sites offer prospective home owners a recommended builder currently working on the new subdivision, but homebuyers have the option to use their own; and depending on what level of involvement a buyer wants, they can choose to avoid the hassles of building logistics. With a population of less than 2000 permanent residents, the Village of Anmore real estate is one of only three independent village si the Great Vancouver area. The building lots at the new Anmore development at Chartwell Green estates ranges from $665,000 to $795,000. Located in the small Village of Anmore real estate market just north of Port Moody, Chartwell Green is a collection of just seven estate home lots for sale. Bring the builder of your choice or use one of the seller’s recommended builders for your dream home at the Anmore Estates at Chartwell Green real estate development in the Tri-Cities. Home purchasers are invited to meet the challenge of sustainable design and guiding principles in their construction of their Anmore home. The property perks for the pre-construction Anmore lots at Chartwell Green lots for sale include being surrounded by greenery and forest, yet only a short drive to Port Moody and Coquitlam Town Centre. The prices for the Anmore Lots for sale at Chartwell Green are from $589,900 for the lots and $1.085M for the homes and Anmore lots together. As construction continues, Brentwood Gate real estate Burnaby development appears to be rising organically from the sloped site. The look is contemporary with a distinctive West Coast naturalness – wood and stone accents, dramatic architectural wood trellises and lush green landscaping, a signature of the Ledingham McAllister Burnaby real estate developers. Inside, the presale Varley apartment homes at Brentwood Gate like all presale homes here show its true artistic nature with a sense of style ispired by the much loved Group of Seven. There’s an interconnectivity to the Varley floor plans, an easy flow that would be as perfect when entertaining the entire family as it is for daily living in Brentwood Gate Burnaby real estate condos. Kitchens, resplendent with rich wood tones and porcelain tile flooring, are meticulously laid out with an efficiency and comfort that’s sure to encourage plenty of epicurean adventures. Master suites at the pre-construction Burnaby Varley condo homes boast a tranquil ambiance with luxuriously appointed ensuites highlighted by square edge counters in a soft matte finish and decadently deep soaker tubs that come standard in every new Burnaby condo at The Varley. Balconies and decks – always near the top of many homebuyers wants – are generous and clearly ready for four season enjoyment of the great outdoors. Even better, virtually every pre-sale Burnaby Varley condo suite will have some kind of view – so whether you prefer to see cityscapes, mountains or pakrs, you can find a Brentwood Gate home to meet your criteria. In keeping with the sweeping beauty of the natural landscape made famous in the group of Seven’s paintings, Brentwood Gate Burnaby is also designed to be a pedestrian friendly, green neighbourhood with a significant amount of large tree retention areas. Walking paths dotted with park benches are located around the new Varley condo homes in Brentwood Gate and will wander through this Burnaby real estate property. For more information, please visit www.brentwoodgate.com or www.ledmac.com. The final opportunity and release of presale condominium homes in Burnaby’s most sought after neighbourhood at Brentwood Gate is upon us. Ledingham McAllister builders has launched the final phase of their master planned Brentwood Gate neighbourhood, and these pre-construction condo homes are now selling very quickly. Called The Varley at Brentwood Gate, this phase is a four storey residential building in Burnaby’s real estate market that features garden homes and presales apartments that are affordable for first time home buyers, couples and empty nesters. The final collection of homes at Brentwood Gate Burnaby real estate will be an exceptional condo offering that is set on the south facing hill next to a permanent green space. The Varley apartment condos are craftsman inspired new Burnaby homes that will be scheduled for completion by spring of 2009. With great floor plans that are open concept and providing large outdoor living spaces in the form of garden patios, decks and balconies, these pre-construction Varley condos at Brentwood Gate will be admired among all home buyers looking to move-in soon into a high-end development. Ledingham McAllister as chosen to design one and two bedroom apartment homes for the Varley at Burnaby Brentwood Gate neighbourhood and have spared no expense in designing the interiors of these elegant homes with modern open style kitchens, living and dining areas. In addition, added touches can be seen in the deep cut pile carpeting, hand set porcelain tile, custom designed cabinetry throughout the homes and walnut or mahogany finished flooring in addition to a Whirlpool appliance set. The pre-sales Burnaby Varley apartment residences in Brentwood Gate are elegant and sophisticated, much like everything else in the community. Other standard features at these luxury pre-sales Varley home include electric fireplaces in the living room with contemporary mantels, walk in master bedroom closets and amazing ensuites. The Varley presales began on September 20th with much fan fare. However, there are still some great condominium units remaining at The Varley, representing your last chance to own a new Burnaby home at Brentwood Gate community. Opened back in the year 2006, the Burnaby real estate market pre-sold the first two phases of Brentwood Gate neighbourhood in a matter of days. The first two of seven residential buildings at Burnaby’s Brentwood Gate real estate master planned community was an overwhelming success to say the least, and with the coupling of a great location with an awesome reputation from award winning Ledingham McAllister real estate developers, these quality homes were snatched up by savvy home buyers very quickly. The Fitzgerald at Brentwood Gate featured a 27 storey high-rise and through five low-rise residential buildings in which The Varley at Brentwood Gate follows, sales again were quicker than expected at the MacDonald House, Carmichael House, Thomson House, Jackson House and The Harris. Each of Brentwood Gate’s seven condo Burnaby presales buildings takes its name from the Group of Seven’s famous landscape artists, appropriate for this natural setting amid green space and tree retention areas. Pedestrian friendly walkways with park benches for quiet contemplation will meander through the Burnaby real estate master plan at Brentwood Gate and The Varley apartments will be on the south slope with amazing views. Truly a livable and environmentally sensitive neighbourhood, please check out the presales Varley apartment condos at Brentwood Gate for your last chance to own a new Burnaby home in this most sought after community. Located at Brentwood Gate master planned Burnaby community at Delta Avenue and Lougheed Highway, the Varley apartment pre-sales offers a total of sixty condominium style homes that range from the mid 600s to mid 900 sq ft layout sizes and priced from an incredible pre-construction pricing of $269,900 right now. The Varley apartments represent the final phase in Ledingham McAllister’s master planned Brentwood Gate Burnaby community. The grand opening for the pre-sale Varley condo apartments was met by long crowds of home buyers looking to purchase in this final enclave in what has become the most prestigious neighbourhood in the Burnaby real estate market. With a collection of garden homes housed in a four storey building on the south facing hillside of Burnaby next to green spaces, the first homebuyers have now purchased their new Varley apartment home at an affordable price point. Craftsman style homes with distinct floorplans and close proximity to public transportation were cited as some of the great selling features of the Varley at Brentwood Gate. Other features that impressed initial homebuyesr here at the Brentwood Gate Varley condominiums include balconies/outdoor spaces for entertainments (some with private yards) in addition to the elegant interiors with modern open kitchens and high end hardwood flooring and plush carpeting. In addition, all the upgrades typically in other condo developments are all standard at the Varley apartments, making your purchase decision even easier.